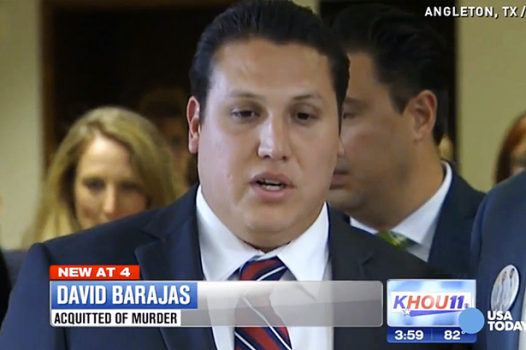 David Barajas (pictured above) has been acquitted by a jury in Texas court after he allegedly shot dead the man who killed his two young sons, David Jr 12, and Caleb, 11. Barajas had been standing trial over the shooting death of Jose Banda, 20, who was found dead in his car shortly after an accident in Houston, Texas. According to prosecutors, David Barajas and his sons had been driving home on the day of the incident when they ran out of fuel near their home. He then asked his two sons to get down from the car and help push it. As the boys were pushing the car, a drunk Banda crashed into the back of his car instantly crushing his sons to death. Prosecutors say an angry Barajas returned home to retrieve his gun which he then used to shoot Banda with a single gunshot to the head. Police searched Barajas house where they found an empty gun holster and ammunition. However, a gun was never found and forensics tests found no trace of gunpowder on his hands.